Happy birthday T. A. Barron (The Lost Years of Merlin), Julie Danneberg (First Day Jitters), and Jerry Pallotta (Apple Fractions). It’s the birth date of Robert Frost (1874–1963). Read Stopping By the Woods on a Snowy Evening illustrated by Susan Jeffers. In 1830, The Book of Mormon was published in Palmyra, New York. Read Nauvoo: Mormon City on the Mississippi River by Raymond Bial. The groundbreaking ceremony for Vietnam Veterans Memorial was held in Washington D.C. on this day in 1982. Read The Wall by Eve Bunting, illustrated by Ronald Himler. It’s Make Up Your Own Holiday Day. On March 26, 1908, Betty MacDonald was born in Boulder, Colorado. Because her father worked as a mining engineer, she spent many years of her childhood traveling around the West. Eventually settling in Seattle, MacDonald attended the University of Washington and wrote The Egg and I, a funny account of her married life on a chicken farm. 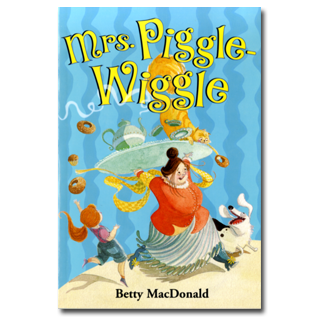 As accomplished as her adult books were, MacDonald is remembered and celebrated for her series of books for children ages six through ten about a charming, but no-nonsense widow who lives in a small town named Mrs. Piggle-Wiggle. Although experts like to say that children want to read books only about other children and are not interested in adults, Mrs. Piggle-Wiggle is an exception to that rule. She loves children and entertains them in a house she has turned upside down. To these young people she gives sound advice about living with and understanding parents. The first volume in the series, Mrs. Piggle-Wiggle, appeared in 1947; the fourth, Hello, Mrs. Piggle-Wiggle, in 1957. At this time most parents got child-raising wisdom from Dr. Spock, but it probably would have been better for them to have consulted Mrs. Piggle-Wiggle instead. The books present a variety of children with different kinds of behavior problems. Mrs. Piggle-Wiggle considers these problems ailments or diseases that, just like the measles, need only to be cured. Although some of her solutions involve magic, most have been grounded in an understanding of children and common sense. Children enjoy reading about these young monsters in the making, who act out in horrible ways. Adults appreciate the happy resolution of each case study, with the family restored to harmony. In fact, Mrs. Piggle-Wiggle believes that everyone in the family really wants harmony. So when two girls fight and quarrel, she advises the adults to engage in the same behavior. Genuinely horrified by watching their parents fight, the girls begin to treat each other with respect, and the family heads out for ice cream sodas to celebrate. Happy birthday Betty MacDonald. Your books, in print for nearly sixty-five years, have made many laugh and many want to read more. How I wish that I could play today at Mrs. Piggle-Wiggle’s upside down house. Mrs. Piggle-Wiggle says that when she was a little girl she used to lie in bed and gaze up at the ceiling and wonder and wonder what it would be like if the house were upside down. And so when she grew up and built her own house she had it built upside down, just to see. The bathroom, the kitchen and the staircase are right side up—they are more convenient that way. You can easily see that you could not cook on an upside-down stove or wash dishes in an upside-down sink or walk up upside-down stairs. Originally posted March 26, 2011. Updated for . I loved the Mrs. Piggle-Wiggle series as a child! I enjoyed reading about children who behaved worse than I did, because then I could imagine that I was a perfect child. The stories are so much fun, and I always loved seeing how Mrs. Piggle-Wiggle ‘cured’ each child of their behavior problems. I was so excited when I found a Mrs Piggle-Wiggle Treasury a few years ago that contains three of the books. I often pick it up and read a story or two for some quick fun. These books are ingenious. Mrs. Piggle-Wiggle gets her young readers to swallow a lot of good common sense advice by giving them a heaping spoonful of humor and fun to wash it down. Read these books out loud to my own children at bedtime when they were young and they kept asking for more. When the second-grade and third-grade teachers at our school read use one of these books as a classroom read aloud, the students rush the library shelves to check out the rest of the books in the series. Fantastic choice for the Almanac, once again! Mrs Piggle-Wiggle is indeed a fun addition for a home (and any library)! Her books obviously double as great read alouds and great books to rely on while learning to read. And that is really useful. Once again, based on the Almanac’s advice – the Mrs Piggle-Wiggle books are on my “To Buy” list. Oh boy, that list never gets shorter. Kids love Amelia Bedelia, too! Don’t know how these rules that kid’s don’t like to read about adults take hold but right now I’m thinking about Abel’s Island and Mr. Popper’s Penguins as well as the wonderful Mrs Piggle-Wiggle. Thanks for the post! My middle son (8) and I are just finishing reading the entire series together. Luckily I still have all of my copies from childhood because I love Hilary Knight’s illustrations so much. It completely cracked me up when we got to MRS. PIGGLE-WIGGLE’S FARM and my son was HORRIFIED at the Maurice Sendak illustrations… not that they were bad, but, as my son said, “Mrs. Piggle-Wiggle looks so WRONG!” I always felt the same way growing up. We have had such a ball reading these together. Thank you everyone for this Mrs. Piggle-Wiggle love today. I’m glad to hear that these gems still connect with young readers. Like Ancient Editor, I loved both these books and the Amelia Bedelia ones, too! Never having had a maid growing up or knowing anyone who did, I loved reading about what it would be like (if in a completely silly, nonsensical way). I’m thrilled to see my old friend Mrs. Piggle Wiggle celebrated here. I loved these, the students who I’ve read them to loved them, and now my children do as well. (And I DO check for hilarious parenting advice sometimes!). When I was younger, I put stickers on books I really loved. I must have put at least three on Mrs. Piggle Wiggle! I read and re-read my copy until it was almost in tatters, laughing the entire time. I loved that each story was short enough for me to read by myself when I was just starting on chapter books. This book was a stepping stone that made longer chapter books seem less daunting. Thank you so much for posting about it! these books are the first books I remember reading on my own. I loved them. The Turnip cure still is indelibly written in my brain.